There were two big knock-on effects from the decision to start Colin Baker’s run of Doctor Who with his own adventure at the end of season 21 instead of a final-minute regeneration and a nine or twelve month break like it usually happens. First, Colin became the Doctor on all the merchandising immediately, which made for some very, very strange comics. Steve Parkhouse was scripting the monthly strip for Doctor Who Magazine and he suddenly had a new Doctor and no idea what his personality would be like. You sometimes see people really praise the resulting run of comics – “Polly the Glot,” “Voyager,” and “Once Upon a Time Lord” – as though they were the high point of the strip. I’ve never been quite as wild about them myself, but the depiction of this brash and boisterous Doctor as a quiet and contemplative figure is unusual and effective, and the visuals are really something else. The run was drawn by John Ridgway. Later on in the strip, Ridgway would just provide pencils for Tim Perkins to ink and I’ve never been as interested in those, but the first two-thirds of the Colin series, with Ridgway’s beautiful inks, look amazing. It’s a pretty good run of stories overall, with a couple of Grant Morrison tales, and those first three in particular suggest a path the television adventures might have taken, with Colin Baker playing a Doctor far less garish. I’d certainly rather reread “Voyager” than watch most of these TV stories again. The other big knock-on was that young Gareth Jenkins’ grandmother had time to knit a Sixth Doctor costume for him. Gareth, then eight years old, wrote into a popular BBC program where the host granted wishes, asking to meet the star of his favorite show. 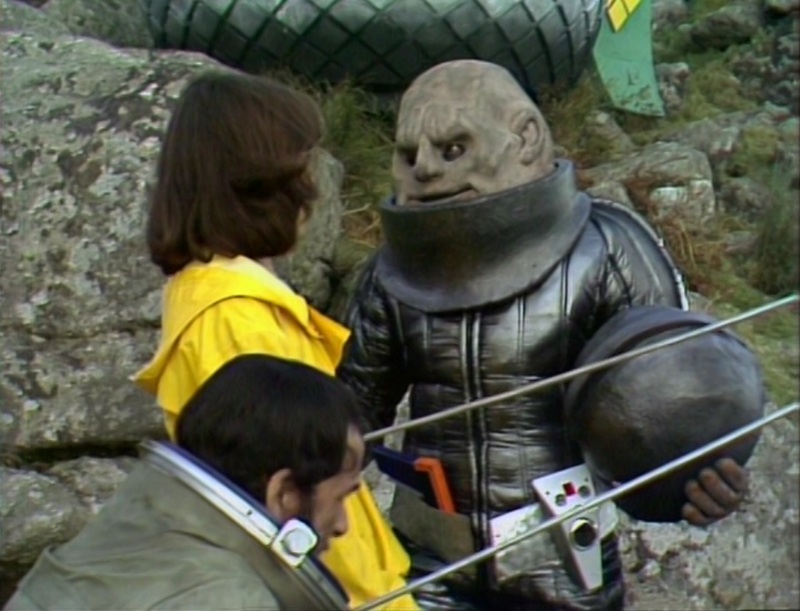 Script editor Eric Saward hammered out a seven minute adventure set in the TARDIS console room, Janet Fielding was asked to swing by Television Centre as Nicola Bryant was on vacation, and the two tall actors who wore those Sontaran suits with the ill-fitting collars were asked to bark out some menacing dialogue and die in a waterfall of green goo. “A Fix With Sontarans” is Doctor Who aimed specifically at kids who dream of flying away in time and space with their hero. For adults, it’s just more of Eric Saward choosing to write nothing for the characters to say beyond insults and arguments. But for kids, it’s just perfect wish fulfillment. Our son thought this was completely wonderful, and the lucky sprog got to walk away with one of those big prop laser rifles. Our kid was jealous. Me too, come to think of it. This little story is no longer commercially available. Some years later, after he died, a police investigation concluded that the host of the program, who had been one of the BBC’s biggest light entertainment celebrities for something like thirty years, had committed dozens of crimes against minors. None of the material that he hosted – including several hundred installments of Top of the Pops, where he had been one of the rotating emcees since the mid-sixties – is available any longer, and none of it can be repeated. 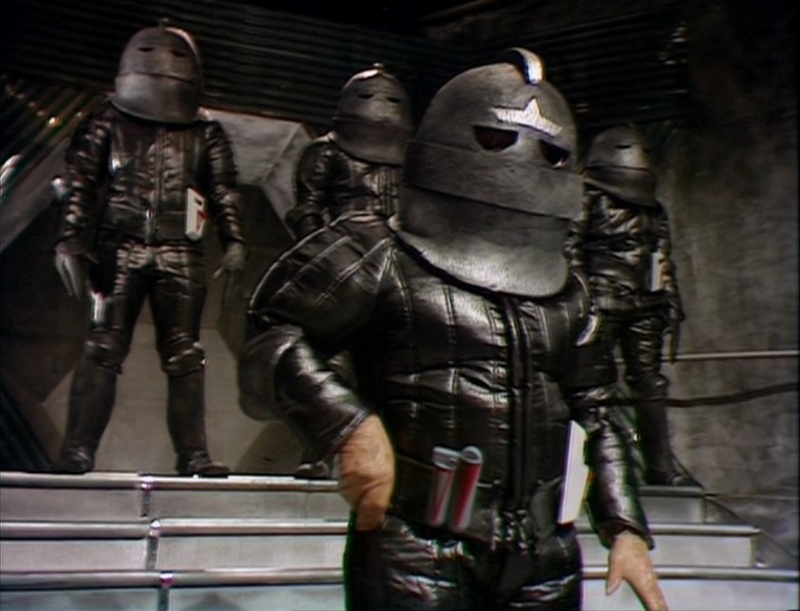 “A Fix With Sontarans” was included as a bonus feature on the original edition of the DVD of “The Two Doctors.” When it was upgraded as a special edition with better picture and sound, “Sontarans” was omitted. So if you click the image above, you can go buy a copy of the “Voyager” comic instead. For a show whose hero owns a time machine, Doctor Who didn’t actually go back in time all that often for a huge chunk of its history. When William Hartnell was the Doctor, they did a “historical” nearly half of the time, but since the show’s later producers wanted to do more science fiction-oriented tales, they phased them out. Patrick Troughton’s Doctor went back in time in only three of his stories, and those are mostly missing. Troughton’s final story, “The War Games,” seems to start in 1918, but that proves to be a feint. 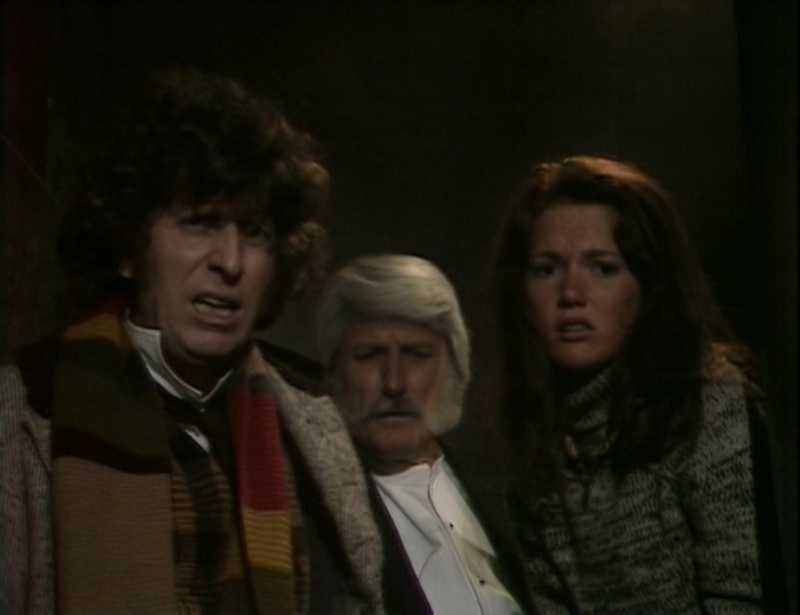 This is the only story where Jon Pertwee’s Doctor is seen to go back in time. I think that Robert Holmes, who wrote this adventure, had such a good time crafting the dialogue and the situations that he made the call to play with historical pastiches more frequently when he became the program’s story editor the following season. I suppose that he could have gone for historical accuracy, but why do that when you can have the villains snarling at each other with Shakespearean-styled insults? 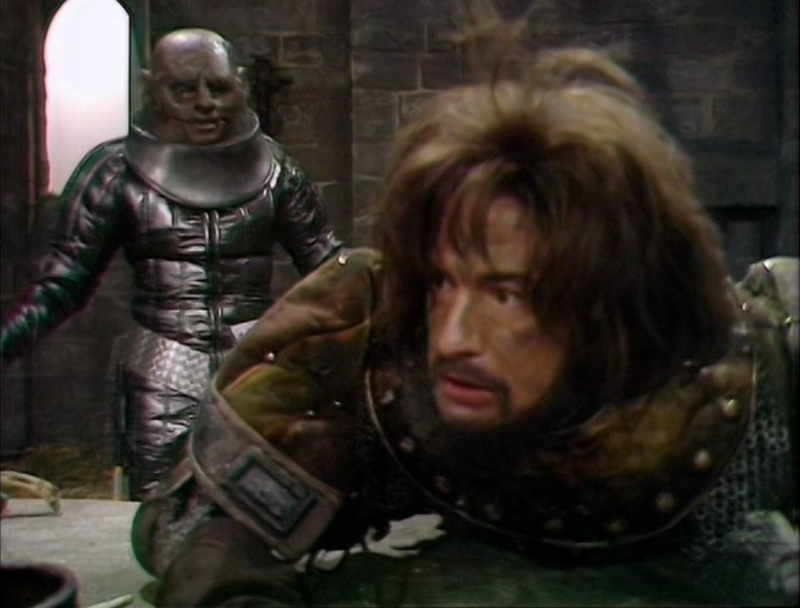 There’s even a lovely bit where the Doctor and Sarah are disguised as friars and speak with a remarkably literate-sounding guard, who assures them of Irongron’s generosity and kind temper. And so season 13’s “Pyramids of Mars” will give us the literature lovers’ version of Edwardian England, and season 14’s “Talons of Weng-Chiang” won’t be the real Victorian London, but the one of Doyle and Rohmer and Freeman and movies about Jack the Ripper. And it’s all so amazingly fun! That hilarious exchange with the guard went over our son’s head, but he had a ball with the scene in part three where the Doctor drives away Irongron’s troops with some stink bombs that send up great clouds of yellow and pink smoke. Linx was a little bit frightening, and he was glad when Linx gets killed by an arrow in the vent in the back of his neck. We’ll meet plenty more Sontarans in the years to come – I will happily confess that I spent most of my sophomore year of high school bellowing “I DO NOT TAKE ORDERS FROM CIVILIANS!” in my best imitation of Major Varl whenever anybody asked me to do anything – but the terrific Linx is the best of them all.